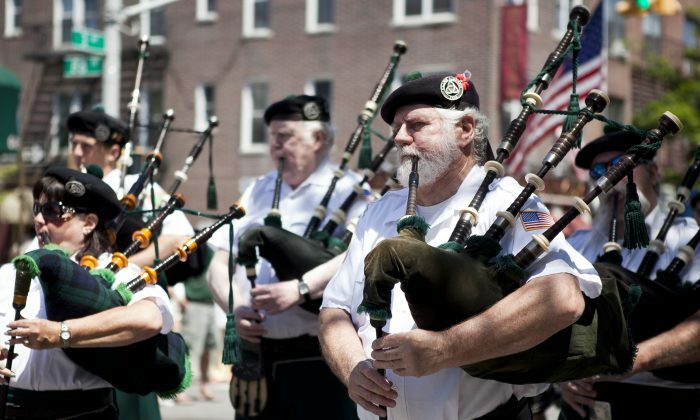 NEW YORK—The sound of drums and bagpipes filled the streets of Bay Ridge, Brooklyn, on May 27 for the annual Memorial Day Parade. The Brooklyn Memorial Day Parade is in its 146th year, making it one of the nation’s oldest parades. It used to be held along Eastern Parkway, and then in Park Slope, but for the past 21 years, Bay Ridge has been home to the festivities. Whether sitting in picnic chairs or standing on their feet, parade-goers waved American flags and cheered for the performers. Parading mainly along 3rd Ave., at 87th Street, the parade turned to 4th Ave. before terminating at John Paul Jones Park, where the festivities continued. The memorial service in the park included a wreath laying, a flag raising, a taps performance, as well as a 21-gun salute by soldiers from U.S. Army Fort Hamilton Garrison. “It’s an honor to be part of this great celebration for our fallen veterans and also to honor [the veterans] as a point for our future generations on how important this event is,” said 2nd Lieutenant Julixa Tejada of the Civil Air Patrol, Flushing Squadron. Tejada was at the parade in Brooklyn for the first time. She has participated in eight parades in other cities. Others, like Leshawna O’Faire, had participated in the Brooklyn parade numerous times. “We come to the parade every year so we can support and honor the troops who served in the military for us and show our appreciation,” said O’Faire, who brought a team of Brooklyn Cub Scouts to the parade. “We come with different boys each time so that they can learn what the purpose of the parade is,” O’Faire added. People, young and old, uniformed and plain clothed, held their hands in salute or over their hearts as the American anthem was sung. “Being that this is the oldest existing Memorial Day Parade, it’s pretty important to me as a Brooklynite to keep the tradition going,” said Michael Grillo, an American history teacher and a local resident. At the deep end of the park, about 300 American flags were planted into the lawn. Each flag held a plastic pouch containing a photograph of a soldier, including an age and date of death. The flags represented 300 soldiers and servicemen from New York state who lost their lives in service to the United States. Linda Hally was moved to tears upon seeing the field of flags. “This goes on with every war,” said Hally, whose father was a World War II veteran. Brooklyn Borough President Marty Markowitz was designated as the grand marshal of the parade, an honorific title. The parade organizers gave Markowitz a gift: the flag that once flew over the hallowed grounds of Ground Zero. “Time and time again ordinary men and women have answered the call of duty and become extraordinary by defending the American ideals of democracy, equality, and justice,” said Markowitz.